As anyone who frequents College And Junior Tennis knows, the players I choose to interview are not necessarily the top-ranked ones. They are ones who intrigue me. When I received a letter asking me to check out Nikola Djordjevic I was most definitely intrigued. He was certainly not a top-ranked player. He has actually not had an ITA National Ranking this year. He does, however, have quite a story to tell. 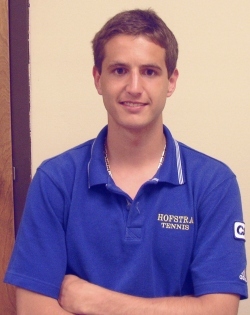 Last year, Nikola Djordjevic became the first ranked college tennis player from Hofstra University. He finished his first season with a 21-3 singles record, the Colonial Athletic Association Rookie of the Year Award and a place on the ITA Scholar Athlete list. But none of that is the amazing part. It's what came before that which sets Nikola apart from other college tennis players and makes him who he is. Nikola Djordjevic came to the Pride site unseen from war-torn Serbia. Coach Bill Gerdts had heard about the 6'3" player from a former teammate and requested a video tape. As he'll never forget, "I put the tape in, watched him for two minutes and said, 'we'll take him.' As soon as I saw him hit a forehand, I knew he'd be an impact player here." I sat down with Nikola last week and have played the tape from our interview many times. While I try to keep our online stories to a minimum word count to hold interest on the web, there is just no eliminating here. It seems especially fitting that I include his words since just today Nikola was named College Sports Television (CSTV) Student-Athlete of the Week. What Nikola has to say about tennis, war and life is just inspiring. So, pull up a chair, print it all out if you'd like, but don't miss a word. Q: I heard News 12 was here today to interview you. Is that the first time you've been on television? A: "I was (on tv) back home a couple of times when my team won a championship. Back home in Serbia our team was the best in the country."